Further on the topic of the previous post but more on to manual compare. DWF Version Compare was introduced in Autodesk Design Review 2008. You find it on the Tools menu. This can be useful when comparing two DWF files. But be aware that it has its limitations like it cannot find differences on raster objects and the DWF files must be the same sheet size and use the same units. If you want to compare PDF files Adobe Acrobat Professional have that functionality and works great with large multipage documents. Found on the Advanced menu. It’s a real time saver when you get PDF files like specifications from a customer, client or colleague and don’t want to read through everything a second time just to find the changes. Below you can see some of the result from Acrobat compare. Microsoft Word also have this functionality to compare two versions of a document. I have found not many are aware of it. In Word 2007 it is on the Review tab. This can also be applied to other formats like DWF (DWFx). Think about the costs if the PDF or DWF is incorrect, missing some important text for example. Say you have automated plotting and even if you make spot checks of the resulting files there is a chance you miss something. We all know that the PDF creation for example is tricky and because of bugs in the software the result might not always be what you expect. The solution is to create a test automation. Say you produce the files from AutoCAD or Revit. What you could do it to produce two different outputs like plotting to both PDF and to TIFF and then automatically compare the result by first rasterizing the PDF file. A software that can be automated to compare images is ImageMagick. Another usage for this is version compare. You can automate a compare of two versions and have that available to the reviewer. Via Adobe Reader Blog with more to read about this topic. Don’t always believe what your eyes see. Below shows the Illusion of shifted gradations. The gray line is horizontal but appears to tilt down to the left. Much more at the Akiyoshi Kitaoka’s illusion pages where some of the hundred illusions are explained in a scientific way like the Explanation (the peripheral drift illusion) (PDF file) for the Rotating Snakes. Autodesk’s DWG TrueView have some inquiry object snaps available with you want to measure a distance or area. TT (Temporary Track Point), FROM, M2P (Mid Between 2 Points), EXT (Extension), and point filters .X, .Y, .Z, .XY, .XZ, .YZ are only available on the command line and not so obvious unless you know about them. Image below is from DWG TrueView 2009 with the object snaps available on the Ribbon. Want a MS DOS t-shirt or some other “softwear”? Tekla Structures, one of the best BIM products for structural engineering and steel fabrication got a new release some time ago. Read the review at AECbytes. The new release should be easier to learn and use and if you’re evaluating structural application you should definitely consider Tekla Structures as it is covering everything from design to detailing, fabrication and construction using any material like concrete, steel, precast concrete, and timber. JTB FlexReport can be used to make assessments of license usage of Tekla Structures 14 (or newer when available) as FLEXnet is now used for the network licenses. Related post on a lmutil.exe problem and Tekla Structures. I was researching a problem in JTB FlexReport that a couple of customers had and the error log gave this error message. It was pretty obvious that the file did not exist as the message said and thanks to this post I got the explanation as there also where “many” empty temp files (0 KB) in the c:\windows\temp folder. Eventually I found the problem and the solution will be included in the next release. It seems to affect very few customers but a hotfix is available in the meantime. 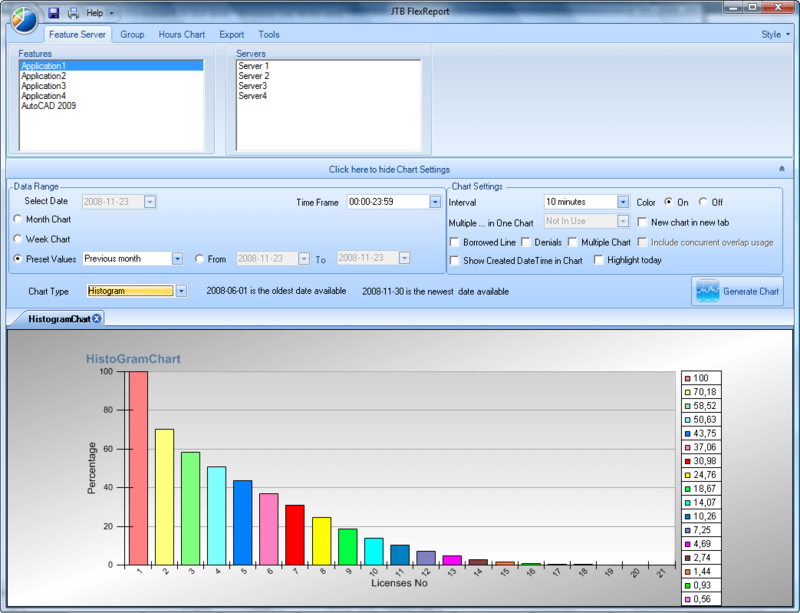 JTB FlexReport 5 is getting closer to be released. Between Beta 1 and Beta 2 at least 20 bugs has been fixed and 10 features have been added based on feedback. So feel free to take a look at this new beta release. The new documentation for beta 2 is here: JTBFlexReport5B2.pdf (3 MB). One new thing is that you can toggle between showing and hiding data labels and markers. Another thing is the axis controller that allows you to make adjustments on the X and Y axis text orientation, ticks and span. Here the X time span has been changed as well as the Y numeric span. You can request a fully functional trial of JTB FlexReport including this new functionality. Via Gregory Arkin’s blog post on IPD (Integrated Project Delivery) I found that the (bim)x blog has much more about the Autodesk IPD project I wrote about in a previous post. This hotfix repairs a problem with the configuration of the redundant license server causing servers to stop when the master server has been changed twice. This hotfix applies to any 2009 or earlier products that use network licensing. The version of lmgrd.exe is 11.5.0.5. This update enables the Autodesk Network License Manager to support IPv6 networks using Microsoft® Windows® Server 2008, Windows Vista® 32-bit and Windows Vista® 64-bit. This version of the Autodesk Network License Manager does not support early return of borrowed licenses. This implementation only supports a mixed IPv4 and IPv6 environment. This implementation does not support network license checkouts in an IPv6-only environment. The version of lmgrd.exe, lmtools.exe, lmutil.exe and adskflex.exe is 11.5. BIMWorld is planned to be combined with Autodesk Seek. See Press release for all details. Another BIM (Building Information Modeling) related news from Autodesk is that Autodesk Expands BIM Software Offering for Structural Analysis. "The new Autodesk Robot Structural Analysis Professional 2009 delivers a great value to structural engineers worldwide by incorporating BIM in the structural analysis and design of building, civil and other specialty structures," said Nicolas Mangon, structural engineering business line manager, Autodesk AEC Solutions. It is designed to be collaborative, faster and more versatile. This in turn will help to provide structural engineers with the ability to do analysis and design better by creating digital models that visualize, simulate and analyze their work. See also Autodesk’s BIM site that has a nice intro video. As I’m under NDA I cannot tell you much but I’ve put together some of the public information if you are curious on what the next AutoCAD release holds. One thing you can expect is better PDF output. Interesting to read that according to Shaan’s tests the AutoCAD 2009 Bonus Pack 2 makes smaller PDF files than AcroPlot and Adobe Acrobat Pro 9. If I find the time I will do some tests myself and look forward to read about others testing this. More on my AutoCAD 2010 page. I was entering a poll on LinkedIn and found it interesting to see the result. As you can see owners and small companies see 2009 as a profitable year. AutoCAD Automation Tools has been improved to make it easier to add files or folders to automate. Select one folder and all DWG’s in all subfolders are added. Now you can use it to only execute AutoLISP files making most any script work possible. Each drawing you want to automate can call an unique LSP file or the same LSP can be used for all or any of the DWGs. But you don’t need to know AutoLISP or programming. If you know a bit of AutoCAD and Excel basic usage you can make use of AutoCAD Automation Tools and make wonders. One example of usage is if you have projects with drawings using absolute paths but want to convert them to relative paths. This can be for xrefs, images or other external references. This is useful if you need to move the project to an archive location or for other reasons don’t want to break the links between the files. This was the user case that initiated this update. If you have an idea you want to realize feel free to contact us. Other example of usage is if you want to search and replace text among many drawings or prepare your drawings before delivering them to the client. You can use AutoCAD attribute export, make changes to the values and then batch update them. The choice is yours. Visit the website to find out more and download a free trial including free support. Price per license is 25 EUR or less. Existing customers are eligible for a free update. What are the limits in AutoCAD? I’m not talking about AutoCAD limits in functionality (there are) but rather the command “limits”. Here are probably most things worth knowing about limits mentioned. If I forgot something please add a comment. Here are some things related to these limits. LIMITS sets and controls the limits of the grid display in the current Model or layout tab. The command can be called transparently using 'LIMITS. When limits checking is on, you cannot enter points outside the grid limits. Because limits checking tests only points that you enter, portions of objects such as circles can extend outside the grid limits. In Drafting Settings (DSETTINGS) you can force the grid to display beyond the limits. The limits are saved in each drawing through the drawing variables LIMMIN and LIMMAX. LIMMIN stores the lower-left grid limits for the current space, expressed as a world coordinate. LIMMIN is read-only when paper space is active and the paper background or printable area is displayed. LIMMAX stores the upper-right grid limits for the current space, expressed as a world coordinate. LIMMAX is read-only when paper space is active and the paper background or printable area is displayed. You can plot using the limits but only in model space (TILEMODE=1). Zoom All displays the entire drawing. If the objects extend beyond the limits, Zoom All displays the extents of the objects. If the objects are drawn within the limits, Zoom All displays the limits. If your drawing has no objects, Zoom Extents zoom to the drawing limits. One great usage of LIMITS and the GRID I have found is when working in 3D as it will make it easy to find the “floor” when navigating around using commands like 3DORBIT and the like. So now we have Live Sync, Mesh and SkyDrive with some common overlap of functionality. Pick and chose. I found this post. Over the past three years Ozzie has been trying to change the culture of the company to one where Microsoft behaves more like a startup. In start-up mode, free from the politics and cross-team collaboration, Microsoft’s many product teams are able to innovate much faster, delivering more useful, game changing products and services. It explains this “confusion” to be thanks to Ray Ozzie and I can agree that it makes some sense. I got this email as I’ve used FolderShare. If you need to know all the productID’s and localeID’s for AutoCAD and AutoCAD-based products this Knowledge Base document is for you: Determining ProductID for Autodesk software. The most common use of them are when you want to automate things in the registry like installations, making changes, etc. The string ProductName in HKEY_LOCAL_MACHINE\SOFTWARE\Autodesk\AutoCAD\R17.2\ACAD-7001:409 has the value “AutoCAD 2009” for example. If you use AutoLISP you can use the function (vlax-product-key) and it will return for example: "Software\\Autodesk\\AutoCAD\\R17.2\\ACAD-7001:409"
This information can be used also with VB.NET, C#, VBA, etc. One example of usage is related to this Knowledge Base document: AutoCAD freezes when plotting to file. When plotting to a file and clicked the Browse button to select the Plot Destination folder AutoCAD locked up and froze. To solve the problem you need to access the registry and find the correct location and for that you need the productID and localeID. I had recently the chance to ask Bentley’s CMO, Ed Mueller (Bio) some questions about Bentley Systems and MicroStation V8i. The release is named V8i. My first thought was that it was an incremental minor release compared to V8. Is that the case and what does “i” stand for? That’s not the case. In fact, V8i is the most comprehensive software portfolio for infrastructure ever assembled in a single release. V8i is not just another release of MicroStation, but of a wide range of applications encompassing products for all of the solution communities served by Bentley, including roads, bridges, rail and transit, campuses, factories, buildings, power generation, mining and metals, oil and gas, water and wastewater, electric and gas utilities, communications, and cadastre and land development. The V8i portfolio leverages and extends core capabilities of its new interoperability platform to provide the breadth and depth of technology needed for fully integrated project delivery. Developed as a collective whole, the V8i software portfolio facilitates streamlined workflows among multiple disciplines and across project teams throughout the infrastructure lifecycle within 60 days of the announcement. · Intuitive design modeling – Project teams can easily take designs from concept to completion in the same software environment. Conceptual tools make it easier to intuitively sculpt solids and surfaces. Generative tools make it easier to iterate through many design alternatives. · Interactive dynamic views – V8i leapfrogs competing software. Users can work in 2D or 3D views and see both update dynamically. With interactive dynamic views, users can save time coordinating plan sets, improve the quality of deliverables, and simplify the 3D modeling experience. · Intrinsic geo-coordination – V8i’s intrinsic geo-coordination lets users coordinate information spatially from many sources using common coordinate systems. Users can locate files spatially with real-world context in ProjectWise for content management or in Google Earth for visual review. This enables V8i users to save time coordinating data from various sources, improve information quality, and reduce the risk of errors on site caused by poorly coordinated data. · Incredible project performance – With Delta File Transfer (DFT), V8i solves the “big file” problem that traditionally slows productivity across distributed project teams. Transferring only changes to files, DFT makes ProjectWise V8i the “killer app” for project team collaboration – with 10x performance gains being the norm for average file sizes. · Interoperability platform– V8i software includes a core technology to persist, share, and visualize infrastructure asset data in a common way. This enables practitioners to reuse project and asset information throughout the infrastructure lifecycle. The benefits of this interoperability to practitioners include reduced data translation costs, reduced project rework, and the ability to create better-performing assets. As you can see, the “i” in V8i is as multifaceted as the portfolio itself. I have quite an Autodesk colored background and I think many of my readers do too. Can you give us some of the selling points for Bentley software, especially in light of the Autodesk agreement and the release of V8i? Autodesk is a very large company that addresses the needs of a wide variety of markets, but Bentley is the global leader dedicated to providing comprehensive software solutions for sustaining infrastructure. That’s our single focus, and I think it shows. Unlike Autodesk, Bentley has a common interoperability platform that enables both intraoperability among its own applications and interoperability with third-party products. Together, these two capabilities enable broader reuse of project and asset information generated during the design, construction, and operation of infrastructure, and enhance the ability of project teams to choose among multiple software offerings. The intraoperability occurs across and between tightly coupled V8i products without loss of information. The interoperability occurs across necessarily distributed projects where participants can now increase their choice of software offerings from Bentley, loosely but usefully coupled with the work of other practitioners using software based on DGN, PDF, DWG, ISO 15926, IFC, and other industry standards and related APIs. V8i’s interoperability platform enables Bentley applications to persist, share, and visualize infrastructure asset data in a common way, promoting collaborative workflows. The result is a project environment that combines flexibility, scalability, and robustness, and a portfolio that offers engineers, architects, GIS professionals, constructors, and owner-operators unprecedented choices across discipline-specific integrated software and services incorporated in Bentley solutions. Bentley developed its interoperability platform in response to the unique requirements of infrastructure projects. Your readers can learn more about this innovative technology by reading Bentley Senior Vice President Buddy Cleveland’s white paper “Interoperability Platform” at ftp://ftp2.bentley.com/dist/collateral/Web/Platform/WP_Interop_Platform.pdf. How will the partnership with Autodesk affect and benefit; first a company with only Autodesk products, second a company with a mix of Autodesk and Bentley products? In both cases, the companies will be able to choose the application that best suits their workflows in particular projects. So, a company with only Autodesk products will be free to adopt Bentley applications. Also, the Autodesk-only company will be able to work with Bentley’s DGN files with absolute fidelity, expanding the number of projects it can bid for – once Autodesk has incorporated the Bentley libraries made available to it under the interoperability agreement. The second company will have the same freedom to use Autodesk’s DWG format or Bentley’s DGN format with absolute fidelity, making its workflows smoother. Both companies will benefit from the fact that neither Autodesk nor Bentley will have to spend time making best-guess approximations of the nature of the other company’s file format. The resources previously devoted to that can be devoted to improving the companies’ software for the benefit of all users. With the global economic problems the world faces today and also the U.S. government’s and the Obama administration’s focus on improving buildings, bridges, tunnels, etc., how and where does Bentley fit into this? With our mission to sustain infrastructure, we look to be right in the center of this focus, especially with the breadth and depth of our V8i solutions and products for the design, analysis, construction, and operation of roads, bridges, rail and transit systems, ports, campuses of all types including airports, factories, buildings, power generation facilities, mining and metals processing facilities, oil and gas plants, water and wastewater systems, electric and gas utilities, communications networks, and other infrastructure. Currently, investors are finding that putting their money in infrastructure is an investment in quality – something necessary and concrete (no pun intended), as opposed to the kind of financial constructions that put us where we are today. Here’s one case in point: In North America, state departments of transportation (DOTs) are finding new and innovative ways to fund their projects, including public/private partnerships (PPPs). For example, in Florida, a contract recently was let to a global consortium led by a Spanish firm to design, build, finance, operate, and maintain an urban-renewal highway project for 35 years. The PPP is expected to accelerate the delivery of the benefits by 16 years and save $275 million in availability payments that were initially projected to total $2.07 billion. Bentley’s leading presence in the transportation arena is well established. Transportation authorities and engineering consultants around the world depend on the Bentley road solution, which has repeatedly proven its value on projects with the most demanding requirements. In North America, these tools are the standard for 47 of the 50 U.S. state departments of transportation, the Federal Highway Administrator (FHWA), United States Department of Transportation (USDOT), and the U.S. Army Corps of Engineers (USACE). So we look forward to enabling our users to take on the mounting challenge of sustaining infrastructure under the next administration, as well as under all future ones. Thanks a lot for your for your time and answers to my questions! License management and support for VPN connections says that it is not supported by Autodesk it does not mean that it does not work. See this previous post on how to use FLEXLM_TIMEOUT and you will most likely find that it does work just fine with this solution to the problem. Autodesk eat it’s own dog food and will live in it too. The interior of the building is being designed and constructed with Autodesk's portfolio of products for building information modeling (BIM) and is the first project in New England to use the integrated project delivery (IPD) model, an innovative approach to design and construction that can accelerate project timeline and reduce costly errors. The building is located at 1560 Trapelo Road in Waltham, Mass., and the interior was designed by architecture firm KlingStubbins and built by general contracting firm Tocci Building Companies. Using the Autodesk Revit platform for BIM, the firms were able to create coordinated, digital design information and documentation, and use that information to more accurately predict energy performance, as well as appearance and cost. I think this is the building that one of the Google cars have taken a photo of. Or click here for Bird’s eye view on Live Search Maps. I think it now shows the old building though. Now Autodesk have provided a way to Disable Help Menu Content in Autodesk Design Review 2009. This is good news as you might not want your users to check for updates for example. If you work with BIM or about to start doing it I suggest you visit ThinkSpace for several great posts on the topic. Right now there is Effects of BIM On Project Lifecycle Phases the 10:th BIM episode. But that was not enough they tried with 1000 times more data. 1PB. The method they use is MapReduce that makes it possible to run multiple processes simultaneously on multiple computers. Inspired by similar primitives in LISP and other languages. AdobeUpdater.exe started to show an annoying empty dialog box each time I restarted the computer. It said the installation was not ready and I could continue it later. I found no way to clearing it or accessing the settings or stopping it from showing up again and again. I tried installing the latest Adobe Updater 5.1.1 update to no avail. If you’re about to purchase both AutoCAD 2009 and a new PC this is worth taking a look at. •AutoCAD® 2009 Software, the latest version of the world's leading 2D and 3D CAD application. •HP xw4600 Workstation with Intel® Core™ 2 Duo E7200 processor offering next-generation performance technologies in a powerful, flexible and reliable workstation. •NVIDIA Quadro® Professional Graphics providing unmatched power and performance. Visit www.hp.com/go/cad and NVIDIA’s Autodesk site www.nvidia.com/builtforpros. BTW. I noticed in NVIDIA’s newsletter NVIDIA Tesla Personal Supercomputer. It is based on the NVIDIA CUDA parallel computing architecture and powered by up to 960 parallel processing cores. I wouldn’t mind having that as a rendering machine. This is related to the AutoCAD 2009 subscription bonus pack 3 Shaan has posted about. I started programming on Sinclair ZX81 with a built in Sinclair BASIC interpreter in the early 80:ies and think it is great to see a brand new, simple and free programming language and IDE. Visit Small Basic to download it and for more information. Small Basic starts with a really simple programming language that gathers inspiration from the original BASIC language. It has no more than 15 keywords and is strictly imperative. There are no classes, scopes, generics, lambdas, etc. - just pure imperative code. The language is typeless and all variables are dynamic and global all the time. The code gets compiled to IL and runs on the .Net Framework. It comes with a set of libraries that can be accessed from within a Small Basic program. Since the language itself is .Net based, new libraries can be created or the existing libraries modified using any .Net programming language. Next, it combines the features of the language and the libraries into a very simple and friendly programming environment. This environment gives beginners, access to professional features like Intellisense(TM) and Instant context sensitive help. It makes writing programs and executing them a breeze. Access to quarterly extension releases for add-on design and testing purposes. As with all Autodesk software provided to ADN members, these quarterly extension releases may not be used for end-user “production” design and modeling purposes – and may not be shared with end-users or outside your company. Access to on-line training classes so you can quickly learn and understand how Autodesk products are designed to be used by end-users – enabling you to better design and integrate your technologies with Autodesk products. This is really great news for Autodesk Developer Network members. Now I can also read “Stoeckel on Subs”. I find no feed though. Process Explorer v11.3: This update to Process Explorer includes numerous enhancements and bug fixes, including a physical memory history graph, options to configure memory tray icons, asyncronous thread symbol resolution and security ID lookup, dynamic recognition of new volume drive letters, multiple character matching in the process view, and a smaller memory footprint. Notice the new tray icon. Read also the excellent post Pushing the Limits of Windows: Virtual Memory on Mark Russinovich's technical blog for interesting facts about physical memory, address space, virtual memory, committed memory, paging file and more. Learn more about what’s in the task manager or even better the Process Explorer. If you are about to planning for purchasing antivirus software consider this. In hopes of getting more consumers protected, this week, Microsoft announced that it will offer a new security solution to consumers at no cost beginning in the second half of calendar year 2009. This new offering will focus on getting the majority of consumers the essential protection they need by providing comprehensive, real-time anti-malware protection, covering such threats as viruses, spyware, rootkits, trojans, and other emerging threats, in a single, focused solution. In order for us to focus on delivering this new security solution to millions of customers around the world, we have decided to phase out Windows Live OneCare and will discontinue retail sales of Windows Live OneCare subscription service beginning June 30, 2009. Question is why? OneCare even have outsold McAffee Virusscan. It probably is another goodwill thing to make Microsoft and Windows look better. Or maybe there was no future in OneCare as it was bloated with printer sharing, networking and performance tuning. Another question is how this will affect other third-party consumer security products. We know that there are still some 60 percent of consumers in developed markets, and even more in emerging markets, that don’t have up-to-date security protection on their PCs, and we want to help provide that core level of protection. …core malware protection in low-bandwidth scenarios, or that will run on less powerful machines. That's why we will design “Morro” to have a smaller footprint and to use fewer computing resources. Via PressPass Q&A: Amy Barzdukas, senior director of product management, discusses Microsoft’s strategy to provide broader access to critical anti-malware protection. I got a problem with Adobe Acrobat 8.1.3 Professional on Windows Vista SP1. I opened a document and after a few seconds looking at it, it disappeared. I tried a repair and then it got even worse. It was not even related to that document. Only a few seconds after I start Acrobat it crashes with no error message whatsoever. Acrobat just quits and exits silently. I tried to run Acrobat as Administrator and then it worked just fine. Then I though about using the general trick to delete everything in the TEMP folder. That solved my problem and hopefully yours if you run into this. This also solved a problem with the Adobe PDF writer that I started to have recently. Great news for those attending Autodesk University. I wish you a great time at AU. There are some limitations with Live Mesh even though it is a promising product. Some files and folders cannot be shared or synchronized. According to this help document there are limits that I sometimes need to work around as I want to use Mesh to move data from one PC to another. My solution was to zip the folders I needed to move/copy and then I synchronized the zip files. For the zipping I use the excellent freeware 7-zip. I wanted this to happen peer-to-peer only so for this purpose I stopped synchronizing with the Live Desktop for the folder I used. The Live Mesh forum is found here. Want to clean up you drawings from extra or garbage layers? The obvious way to purge layers is to use the Purge command but sometimes it’s not enough. Purge might need to be run several times. Make sure to select purge nested items. Try to open the drawing with RECOVER or run AUDIT on it and then run PURGE and select all and also purge nested items and it will probably go away. Sometimes this needs to be repeated several times. In the Purge dialog box you can find items you cannot purge. Layers can exist nested in blocks. They can be used by empty text strings (QTEXTMODE can be used to show these) or lines without length or even viewports that have the layer frozen. LAYMRG (Layer Merge) or LAYDEL (Layer Delete) might be able to help you either merge the layer to for example layer 0 or if you don’t care what’s on the layer delete it. LAYWALK is also useful to see what is in each layer and can purge unreferenced layers. LAYTRANS can also purge layers. In the Layer Translator, right-click in the Translate From list. Click Purge Layers. To use the filters in the Properties palette (QSelect) can also work but you might need to explode everything several things first. Another way to generally purge a drawing is to Wblock the entire drawing to a new drawing or use –WBLOCK and * for whole drawing or you can Wblock selected objects. You can also try to isolate the problem by deleting 50% of the drawing, try to purge and then keep repeating it until nothing is left. If the layer is still there it might be used by some kind of object that is not purged using the plain purge command. It might be something in a vertical like AutoCAD Architecture and then you have to maybe purge using the style manager. DXF can also help. Save as DXF or use DXFOUT command and open in a text editor and search for the layer to see where it is used. SmartPurger can help you automate your purging and scripting work. What is your trick to purge layers? I noticed that the AutoCAD Architecture page on Wikipedia was really limited so I have edited it. Please head over to the page and add to it or make further changes. If there is anything that is unclear you can add to the discussion page to discuss about the content. I think I got the release dates correct for ADT v1 up to ACA 2009. Maybe add something on BIM. Personally I’m among those that think that AutoCAD Architecture is more than only AutoCAD for architects.